I've been eating Fudge Rounds since I was a little kid, and they are still one of my favorites. They are soft chocolate cookies with some chocolate icing in the middle of them. That is the best part. I love to eat around all of the edges and then eat the middle part. 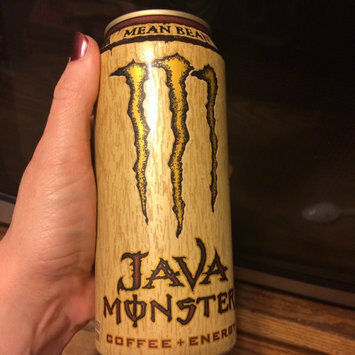 I have never been a fan of energy drinks, and the very first Monster I tried was this Java Monster Mean Bean. I was surprised at how smooth it was, and it tastes like delicious cold coffee. It's got just the right amount of sweetness, and the coffee flavor is just right. It also made me feel more energetic and www a nice pick-me-up. I'm addicted to it now! These Reese's peanut butter pumpkins are so delicious. The peanut butter is salty and sweet, and it's nice and thick. The peanut butter taste goes perfectly with the chocolate. I recommend them to everyone. My daughter is not quite two years old yet, and these are her favorite snack. We actually eat the Veggie Straws more than the Chips, but they are both good. She will turn down everything other snack I offer her, but she always wants to eat these. They have a nice crunch to them, just the right amount of salt, and they taste delicious. They have no GMOs, no trans fat, no cholesterol, no artificial colors, flavor or preservatives! We all love them and buy them every week! These chips are some of my favorites because they really do taste like tomato, and they have just the right amount of basil added for the perfect flavor combination. They would go great with a grilled cheese sandwich, but I eat them by themselves most of the time. Goldfish are the perfect snack because they are bite-size and full of flavor. These taste like graham crackers with vanilla frosting, and they are so good! The only problem you will have is not eating the whole bag at one sitting! Keebler Club crackers have a nice crunch and a delicious buttery flavor. They go perfectly with the cheese filling of these sandwich crackers. I loved them as a child, and I still do! These potato crisps have a nice crunch and potato flavor, and the salt and vinegar really give them a nice kick! I like to eat them with the flavor side down on my tongue so I can taste the full flavor. My mouth is watering just writing about them! I just tried these for the first time a couple of weeks ago at my sister's, and I had to go out and buy a bag of them for myself. I used to like chocolate covered raisins until I tried these. These are about the size of malted milk balls because they have a thick layer of chocolate on them. They are the perfect blend of tartness of the pomegranates and the sweetness of the chocolate. Who knew that dark chocolate and pomegranates together would be such a heavenly combination that I can't get enough of? I don't even want to share them!